Starting from Feb 14, visitors from 20 countries and one business district will be able to apply for a Thai visa via a new service called eVisa On Arrival (eVOA). 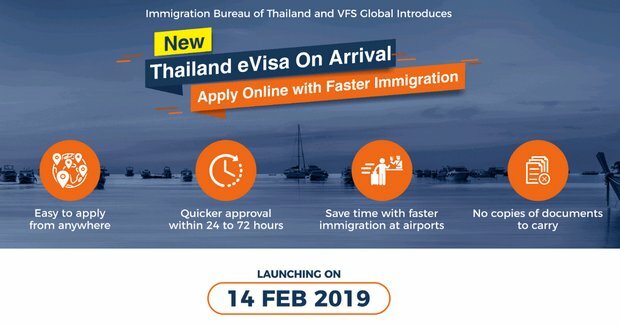 According to Immigration police chief Pol Lt Gen Surachate Hakparn, the system, developed jointly by the Immigration Bureau of Thailand and VFS Global, will cut the processing time for visas on arrival at airports to as little as one minute. “The new eVOA service will offer travellers a whole new experience when applying for a Thai visa as they can fill out the electronic form and make an e-payment any time regardless of embassy working hours. Once the tourists arrive at airports, they can show their passports at specific counters to obtain a visa in just one minute, rather than a one-to-two-hour wait,” Pol Lt Gen Surachate said. Under the new system, people can also receive their travel authorisation online prior to departure within 24 to 72 hours of their application being submitted. Pol Lt Gen Surachate said visitors will be able to use the eVOA service available at thailandevoa.vfsevisa.com from 30 days to at least 24 hours before arriving in Thailand. The site currently displays a “coming on Feb 14” notice. They can also pay their visa fees in advance using Mastercard, Visa and Union Pay credit or debit cards, or via WeChat Pay and Alipay, said Pol Lt Gen Surachate. Pol Lt Gen Surachate said the fast-entry online visa system will initially be available to nationals from Andorra, Bhutan, Bulgaria, China, Cyprus, Ethiopia, Fiji, India, Kazakhstan, Latvia, Lithuania, Maldives, Malta, Mauritius, Papua New Guinea, Romania, San Marino, Saudi Arabia, Taiwan, Ukraine and Uzbekistan. They will be eligible if they arrive at any of the four main international airports: Suvarnabhumi International Airport (BKK), Don Mueang International Airport (DMK), Phuket International Airport (HKT) or Chiang Mai International Airport (CNX). The service will be available at more airports later this year, officials said. The government recently waived a 2,000-baht, visa-on-arrival fee for visitors from the same 21 countries until April 30 in a bid to boost the number of tourists during the Chinese New Year holidays next month and Songkran in the second week of April. Tourism and Sports Minister Weerasak Kowsurat said he expected the eVOA service and the exemption of fees for visas-on-arrival would have a significant impact on tourism visits to the country. “Thailand is the first country to offer this eVOA service. Together with the exemption of fees … it will help boost tourism, which represents around 20% of GDP,” he said. Thailand last year welcomed a record 38.27 million tourists, up 7.5% from 2017. Chinese tourist numbers dipped following a Phuket boat accident in July that resulted in 47 Chinese casualties but records showed that arrivals from China were up on-year in December.